To enter, just visit the Minnetonka for Hello Kitty page and leave a comment here stating which pair you love the most! You can gain additional entries by liking on Facebook, following on Twitter, or following on Instagram! This giveaway is open to US residents only. The winner will be drawn on Tuesday, September 2nd and announced shortly after. Please leave a separate comment for each entry. Good luck, friends! I also follow Minnetonka on FB as Amanda G.
The little pink Kilty mocs are soooo cute! I'm getting married in May and my little flower girl (who loves pink) would be head-over-heels for these as a gift! I love the kid's fringe boot! So cute! I love the kilty moc! 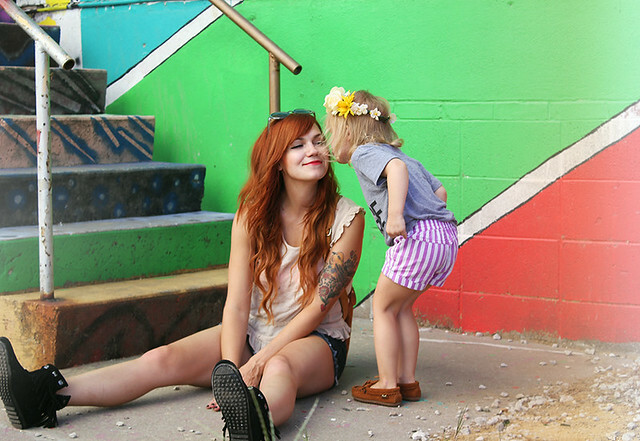 This would be so cute for me and my daughter! these are sooo cute!!!! I'd LOVE the MINNETONKA FOR HELLO KITTY ® KILTY MOC (CHILDREN'S) for my daughter!!! I love dusty brown hello kitty fringe boots! following in Instagram- I really wanna win. I'm a fan of Minnetonkas on FB! I also follow Minnetonka on Instagram! Oh I love the women's fringe boot! I love the children's brown fringe boots! They would be perfect for my little lady to wear this fall! Love the fringe boots in dusty brown! Oh my goodness! Two of my favorite things together. Those black fringe boots are mine even if I don't win. Thanks! I like the brown kilty moc. I LOVE the ones you're wearing. The fringe boots, so cute! And what a fun giveaway!! You're the cutest! I like them on Facebook, Following on instagram. and my favorite pair is Kilty mocc in Black!! SUPER cute! I also like the fringe boot in black! SUch a fun giveaway! EEK! My love for Hello Kitty and mocs united! I loved the Minnetoka finge boot! That trim!! So much cute! I adore the women's fringe boots in brown! Too cute! What a fun giveaway and collaboration. I have little boys and they just love Hello Kitty! i love the pink ones for adults! however i would like to enter for a friend and her daughter. and these would be perfect considering they are going to the hello kitty convention in LA later on this yeat i believe! id love to surprise them both with a pair! what i love even more, theyre not crazy over priced!!! I like 'em on Facebook. I follow 'em on Twitter. Aaaand I follow 'em on Instagram. Thanks for the giveaway, Katie! I love the brown fringe boot for women! I love Hope's pair! So subtle and so cute! i like the black fringe boot for women...they could easily be worn with so many dresses! i love the brown fringe boots!!!! i love the brown fringe boots!!! Love the black kilty moc! I love the fringe boot (both womens & childrens) in dusty brown. Oh, how I love Hello Kitty! Thanks for entering me! The children's kilty moc is too cute! Oh, the hot pink fringe boots for kids are so cute. I bet my daughter would love them! Also, I follow Minnetonka on Facebook. Also, I follow Minnetonka on Instagram as @kimbercrafts. 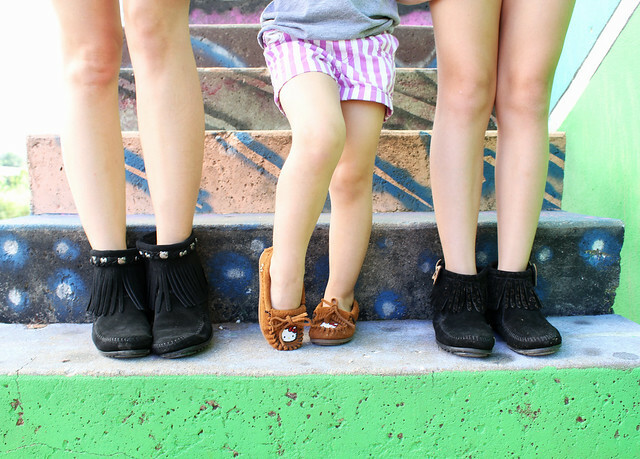 I love the brown fringe boots for kids and the brown flats for adults, so SO cute!! Kilty Moc in brown! Ohmygosh! So cute! The kilty moc in brown! Ohmygosh! So Cute! THESE SHOES ARE THE BEST! I love the brown MINNETONKA FOR HELLO KITTY ® KILTY MOC (WOMEN'S) Style: #605K. I love the Hello Kitty Kilty Moc. My niece, Katrina, would go crazy for them she loves Hello Kitty so much. Keeping my fingers crossed, thank you for hosting this giveaway. Also, I follow Minnetonka on Instagram. Thank you again. I love the adult fringe boot in both colors, so cute! I like the fringe boots in brown for adults and for my nico I would like the fringe boots in pink! These are so cute, especially for the little ones! I liked the brown Fringe Boot best, I mean, who can turn down a fringed moccasin! I would love the pink mic for me and my little girl. So sweet and girly! <3 <3 <3 thee new HK moccasins, my faves are both women's/lil one's fringe bootie in either black or brown. Too adorable!! MINNETONKA FOR HELLO KITTY ® KILTY MOC (WOMEN'S) cute! I Love the Children's tan bow boot. So Cute!!! I love the kilty mic in pink for both me and my LO! So cute! such a great giveaway. i've been looking at these for myself and my daughter. i'm a big fan of the black kilty moccasin for adults and children. Ooh so pretty! I love love love the brown fringe boots! I'm a follower on Instagram, too! My baby girl loves hello kitty, the brown fringe booties are too cute for mommy and baby! I love the dusty brown fringe boot for me and the pink fringe boot for my daughter. These are awesome. The hot pink Hello Kitty fringe boots are my favorite! Thanks for the giveaway! I'm a follower on IG! The pink little girl mocs!! I love the black fringe boot for women! So adorable! The whole collection is great! My little babe is obsessed with boots, and those pink fringe kiddie boots are right up her alley. ha. I also liked on FB and Twitter. Oops, I wrote all my entires in one comment. So here's my comment for liking them on Facebook. I love the black fringe booties!!! The brown mocs! So versatile but with a cute spin! I listened to my Hello Kitty cassette every night when I was a little girl, so this brings back memories. I'm loving the black women's fringe boots for me and the children's pink fringe boots for my little girl. Such a fun giveaway! I've always loved Minnetonka and hello kitty, so combined, I'm in heaven! Haha. The brown women's moc is my favorite. Casual enough for everyday, but with a fun Hello Kitty twist! fringe boot for me, please! I really love the ones that Hope is wearing. Wish they came in adult size. I love the women's fringe boot in black!! I followed them on Instagram! I love Hello Kitty! The brown kiddo mocs are my fav! I love the brown fringe boot! I love and collect Minnetonka shoes and moccasins. My favorite pair from the Hello Kitty collection are the girls fringe boots in black. The bow on the side is too cute. I wish they made these in my size! I love the little girl mocs in tan and pink!! They are adorable! I love the black fringe boots! I love the black Kilty Mocs for myself, and the black ones for my little girl! My first comment didn't go through. What an awesome giveaway! I love the pink fringe for my 3 year old and the dusty brown fringe for myself. Actually, that's a lie; I love them all. I LOVE the fringe boots for myself and my daughter. But, all the styles are adorable! I LOVE the hot pink Kilty mocs! I have a normal brown pair that I literally wore to death last fall. The Kilty Mocs in Hot Pink are adorbs! I am obsessed with Hello Kitty and love Minnetonka. I own five pair. This whole line is absolutely perfect! My favorite are the dusty brown fringe boots. The kilty moc for kids is just too adorable. The fringe boots are amazing! I just love the fringe booties for the grown ladies & the brown kilty mocs for the little ladies. I don't have a little lady but I can make my son wear these, right? I liked and Instagram and Facebook! I don't tweet. I absolutely adore the Minnetonka for Hello Kitty Kilty Moc for me and my 2 year old in Hot Pink! I fell in love with the brown fringe booties last year and need to geared up for this autumn season since she's outgrown hers. I am following @minnetonkamocc on Twitter as @yesandnazzy, and have to say the Hot Pink moccs are too fab! Thanks for this fun giveaway. I am a huge fan of hello kitty, and grew up with so many characters from Sanrio! I love the black fringe for me, and the matching black fringe boot for my future niece! So cute!!!! I love the MINNETONKA FOR HELLO KITTY ® FRINGE BOOT (WOMEN'S) the most! I think I like the either the black fringe moccasins or the traditional brown ones best! I love moccasins! I love the fringe boot in brown for me and the same kids for my daughter! I love the kilty moc in brown! I'd pick the pink fringe boot for my girl, Sarah, who is very much into Hello Kitty right now. For myself, I'd choose the brown fringe boot. I've always been into Hello Kitty ;) I also remembered what a treasure it felt like to own anything from Sanrio as a kid. I had pencils I wouldn't sharpen, erasers I would never dare to use and a little pack of Keropi Kleenex that I wouldn't open for the anything, ha ha! Also, that little toe pose (2nd photo down, the photo of all your legs) is too adorable!